When we speak to the Mohawks of the Kahnawake Indian Reserve in their mother tongue, if only to say thank you or goodbye, we immediately see a smile appear on their face. Yet, few Mohawks in the province of Quebec still speak their language fluently. As with most Indians of Quebec, the residents of the reserve, located a few kilometres from Montreal, have been affected by the Canadian Residential Schools policy, and at least one generation has been prohibited from speaking Mohawk at school. Since then, the community has taken initiative, and Mohawk-language learning programs are multiplying. In the classrooms of the Karihwanoron elementary school (the name means “precious things”), children learn the name of different animals in Mohawk, like the wolf, the bear, or the beaver. A table also presents the different birds of their environment, such as the blue jay, the cardinal, or the goldfinch. From preschool to sixth grade, the academic programs are completely in Mohawk. The children study mathematics and sciences in Mohawk, and they rediscover different elements of their culture like prayers, dance, songs, and agriculture. In the classroom, two teachers, a man and a woman, guide the children. “We want to recreate a home-like environment where children are supervised by two parents,” explains Joely Van Dommelen, the current Joely Van Dommelen | © Caroline Montpetit school director. Karihwanoron is the only school of the Kahnawake reserve that offers education exclusively in Mohawk up until the sixth grade. It was Joely’s mother along with a dozen other parents that founded the school 29 years ago. She herself no longer spoke Mohawk while her mother, Francis Dione, Joely Van Dommelen’s grandmother, spoke the language fluently. But Francis Dione had been forbidden to speak Mohawk at school during her childhood. Only one of the seven teachers at the school has Mohawk as her mother tongue. All the others have reclaimed their original language through various trainings. “At the very beginning, about six kids were registered at the school, but now, we have about 35 to 45 children,” continues Joely. Mrs. Van Dommelen’s fours kids have attended the Karihwanoron School, but only one of them is fluent in the language. “When my oldest daughter was enrolled, the program was not yet available for the six graders,” she says. It should also be noted that since the school doesn’t provide the program prescribed by the Quebec Ministry of Education, it does not receive any government grants. Indeed, no French or English language classes are available to the children, and no Canadian history courses are offered. “Inside the reserve, English is everywhere, so they learn it anyway. However, it’s different for French, where they have more difficulties,” admits Mrs. Van Dommelen. Aboriginal languages are rooted in oral traditions, and that is how knowledge is shared in Karihwanoron. “Dictionaries have been created but we don’t use them very often. Books are used more for subjects such as mathematics,” says Joely Van Dommelen. Once in high school, students are somewhat behind, but they catch up later on, according to Joely. 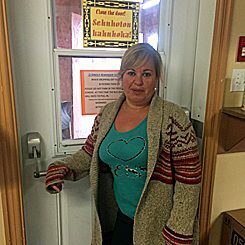 “Full Mohawk-language immersion programs should be available in high school as well as at the university level, says Watenhentiiostha, a teacher at Karihwanoron School. Since preschool-aged children, from the age of 18 months, are attending the school, it receives some money from the kindergarten fund, as well as extra money from the next door school, The Indian way, which provides teaching in Mohawk until the fourth grade. Also, Karihwanoron School must consistently look for funding both within and outside the community, to pay for the staff’s salaries. Once again this year, the school is at risk of closing due to funding problems. In 2014, in a survey of 376 residents conducted by the Kahnawake Language and cultural Centre, only one child under 18 years of age spoke Mohawk fluently; two young people between 18 and 30; 4 between 31 and 49; 13 between 50 and 69; and 27 aged 70 years or older. When she talks about the days when Mohawks were prohibited from speaking their language at school, there are tears in Joely’s eyes. She even attended school outside of the reserve, in the neighboring community of Chateauguay. On her deathbed, her grandmother’s last wish was that her children and grandchildren speak their mother tongue as often as possible, and to never give up, whatever happens. She herself never stopped speaking her language even if it was forbidden by her school. “For us, this school is somewhat managed on a familial way,” Joely continues. During the morning first period, children carry out a form of Thanksgiving according to the Mohawk tradition. They thank the Earth and vow not to take away its power. During the day, they learn kitchen duties and handicraft, gardening, and dancing, among other things. The school doesn’t have a gymnasium at the moment, but children can play outside and on the swings that were donated. “We sometimes go to the Kahnawake gymnasium,” says Joely, who would really like to have more money available to expand her school. For the parents of the children that attend Karihwanoron School, learning the language is essential. They get involved in various fundraising activities for the school. For Mohawk culture, this is nothing less than a matter of survival. In the meantime, if you have the chance to say to them “o :nen” instead of goodbye, or “nia : wen” for thank you, you will certainly see a sense of pride in their eyes. Copyright: Text: Goethe-Institut Montreal, Caroline Montpetit. Dieser Text ist lizenziert unter einer Creative Commons Namensnennung – Weitergabe unter gleichen Bedingungen 3.0 Deutschland Lizenz.